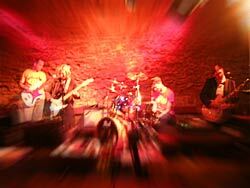 This is the website of Krabat, a German rock-band from Wächtersbach / Hanau and the surrounding area. The band is in existence since the early nineties with varying lineups. Today Krabat are: Anja Wylezol (vocals / guitar), Andreas Koch (guitar / vocals), Ingo Schaefer (bass) and Hans Peter Werner (drums). The feel of the music ranges from atmospheric and mellow to energetic and rough. The band is very proud to be playing their own material. Three CDs have been released so far - the latest is called waiting for the next big thing and can be obtained at the Herzberg-Verlag-Webshop, which is run by our label. For more information in english, please visit our Myspace-page www.myspace.com/krabatband - you can also listen to some of our songs there. If you want to contact us, feel free to use the contact-form to send us a message.